Salsa was born between the late 1800's and early 1900's. It's a blend of several Caribbean rhythmic and musical styles: Rumba, Son montuno, Conga, Guaracha, Mambo, Chachacha and others. This musical mixture is due to the contributions of diverse cultures, particularly the African and European cultural influences, which found fertile ground in the Caribbean region.. The African population played a key role in the musical,and economic, development of this new frontier. During the colonial period, Havanna become one of the most important ports in this "new world". Ships came from many European countries. France and England possessed colonies in the islands as well and Cuba came to be populated by a wide variety of races and nationalities. 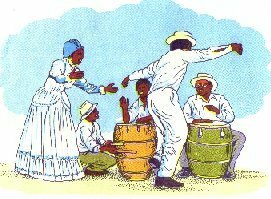 During this time, in the hills, countryside, and on the sugar cane plantations SON, a popular song form,was born.Many variations came forth from this : SON MONTUNO, became the rhythmic foundation of Salsa. Another rhythm which left it's traces in Salsa music is Rumba, a Cuban rhythm originally interpreted by the black African population. It was synonomous with celebration, joy, and dance. Like the Rumba, the Conga, and the Guaracha contributed to the birth of the Salsa. 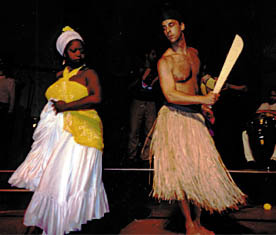 Cuba had a fundamental role in the evolution of music, dance, and customs in Latin America. It was the birthplace of these forms of musical expression which fused together with other Caribbean styles to give life to the "magic of Salsa", music which fascinates, seduces, "get's in your blood", and brings happiness to so many people. No one denies the Cuban origin of Salsa, the music is accredited to the Africans in Cuba, but "Salsa" was really the music produced in the Puerto Rican ghettos or "barrios". It was the music born in these extremely poor neighborhoods which helped maintain an idea of community in a nearly impossible economic environment. .
Called "Son" by the Cubans and "Bomba" by the Puertoricans, it finally became known as "Salsa". Many are the Puerto Rican musicians who contributed to this spicey Salsa music...In fact it's said that "The Salsa was born in the "barrio latino" of New York of a Cuban mother and a Puerto Rican father". After the Cuban Revolution, New York became the place to find success in the Latin music world..."The Big Apple" with it's clubs, theaters, and recording industry was a great stimulus to the development of the Salsa sound. . Among the most important musicians responsible for this musical renewal are: Willie Colòn, Eddie Palmieri, Ray Barreto and Larry Harlow. New York was a place with the potential to experiment and amplifly this new sound , but it needed a name for it, for marketing purposes...the energy, heat and rhythm of the music was hot and spicey...like Salsa...the spanish word for "sauce"....that's it ..."Salsa Music" was born! In the 70's and 80's, Salsa music took over the entire Latin American continent and is now spreading like wildfire throughout the world. Salsa dancing tends to reflect the sensibility of the various nationalities present in Latin America. The Venezualan and Colombian style are both rather simple though very elegant and seductive. It is characterized by marking time in one spot , holding the partner tenderly and moving the hips very sensually. The Cuban style is more complex and is characterized by the execution of "figures" and is also very sensual as well. It requires more study and pratice and is definitely the most fascinating "flavor" of Salsa. In fact, it's what you see the most in latin clubs and salsa dance schools. These latin -american dances have made a great difference in many people's disco experience, dancing together in couples, etc...it's a more "socializing" experience....i.e. "FUN !" The Merengue comes from the Dominican Repubblic and dates back to the 16th century, thanks again to Africans brought as slave laborers on the sugar cane plantations. It's an authentic piece of Dominican folklore. Another story of music helping people to survive. The merengue never stops..it's everywhere...in the streets, discos..this rhythm pulls you in! This is another dance for couples and... very sensual. The Merengue is a weapon of seduction used by the man in his courtship of the woman. There's a lot of room for improvisation here and it is fairly easy to learn. This is a popular dance from Santa Domingo which has spread throughout Central America and is seen in New York and Europe as well. The Bachata is a slow romantic dance ...full contact...no complicated steps or turns. Another seduction secret of "latin lovers". Have fun !